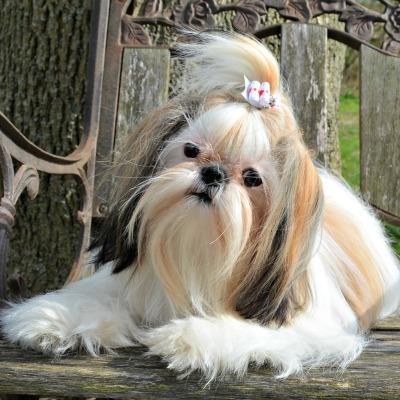 Is Shih Tzu puppy socialization necessary for your new Puppy? You now have that wonderful bundle of furry joy, thought about her physical needs, but now it is time for a little socialization. How are your new puppy’s social skills? Puppy Socializing will eliminate many bad habits and behaviors that can occur in your breed of choice and assure that you dog will become a good canine citizen. Many small breed dogs go everywhere with their owners; some in the luxury of a purse or stroller and others enjoy frequent walks on their own locomotion. Wherever they go, they must learn how to respond appropriately in all situations from riding in a car to visiting the park. Well socialized Shih Tzu puppies are easier to train, and trained puppies are easier to live with and enjoy. Very few well trained; socialized puppies turn into adult dogs that find their way to the local animal shelter or rescue organization. Socialized dogs won't be labeled with the term, Small Dog Syndrome, a set of behaviors seen in small dogs such as jumping up on guests, ignoring commands, making in the house, barking, chewing and anything else they can get away with. It is a small dog’s way of acting big, and it is usually the result of the way we treat our pets. Shih Tzu puppy socialization is also important because it helps prevent just those behaviors mentioned above that end up turning into major behavioral problems such as dog phobias, separation anxiety, aggression, and destructive behavior. Shih Tzu puppy socialization begins at birth, and if you have acquired your puppy from a reputable professional breeder, you can be sure that he or she has been hard at work, interacting, touching, holding and exposing your pup to a variety of sights, sounds, smells, and routine household occurrences. 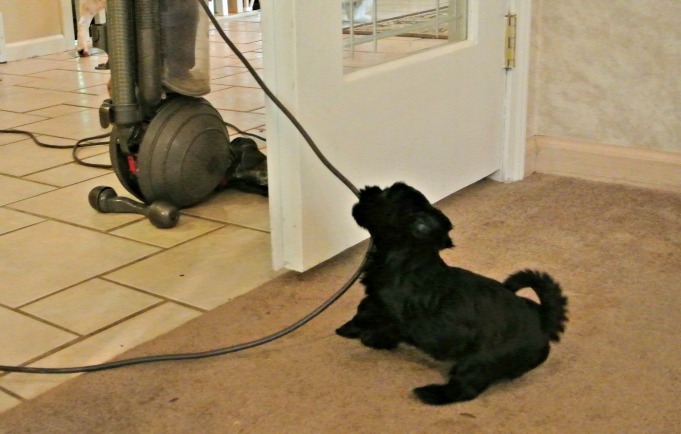 If the breeder raised the puppies in her home, your new puppy will already have heard and experienced the vacuum cleaner and other household appliances at work, the sounds of cats and other dogs, and felt and played on a variety of textures from wood and carpeting to tile, brick and stone. Please click on the link to learn more about puppy development. The puppy will have already had had some encounters with a wide variety of people, children, teens and adults, men and women, people that wear boots and hat and carry umbrellas. Some of those people will be tall, some overweight, and some that talk very loud. This is how your puppy's breeder is helping in the Shih Tzu puppy socialization process. Socialization goes hand in hand with training so the wise owner will want to make sure his little puppy learns right from wrong from a very early age. Sounds easy? Well it can be and should be FUN. As you begin your life with your new puppy, you will naturally want to show him off to friends, family and the community at large. Use our check-off list to expose your puppy to many new sights and sounds. Think about all the different places you can take your dog. Think about the people you know who will love to meet your new dog. The first few months of a dog’s life are critical for socializing, but Shih Tzu puppy socialization and training should be a life time project that strengthens the bond between the two of you. Don’t “baby” your puppy or teach him to fear something such as a thunderstorm, loud noises, air horns, or other large animals. The best approach you can take when you perceive your puppy’s fear is to approach them as any good canine mom would—matter-of-fact. Do not cuddle, coo over, or hold your pet as you might a frightened child. Simply say, “Oh, that is thunder,” and go about your business. Your puppy will get the idea. Do Shih Tzu dogs need to be socialized around other dogs? Other animals? Some owners say no and the reasons they give are numerous. My dog is an indoor dog. I don’t plan to take my dog to a dog park. I don’t plan to get another dog. I don’t plan to let my dog interact with other dogs. My dog will always be in my pooch purse. These may be noble “plans” but situations change; people change, and our beloved pets must also adjust in response to our life changes. Socializing a puppy to other dogs is much easier when the dog is young rather than hoping for the best if your life situation changes and you must push your adult dog to change too. One of life’s greatest gifts is the bond and love that develops between a human and their pets. Shih Tzu puppy socialization is one way to develop that bond and assure that the love will stretch into the next 15 plus years. Experienced 12 different challenges: climb on, in, off and around a box. Been handled by owner such as 12 times a week and held in different ways. If you are just picking up your puppy at 12 weeks of age, continue this routine for several more weeks. When making plans to socialize your dog, do take into consideration the puppy's personality. A very outgoing Shih Tzu puppy is likely to thrive in an environment where there are plenty of new sounds, sights and smells. Shy puppies may find all of this too overwhelming. Best Takeaway: Puppies need socialization and these skills will last a lifetime. However, the first few precious months of a puppy's life should not be overwhelming stimulation after stimulation. Consider the Goldilocks Principle: Not too much, not too little, but just the right amount of socialization.